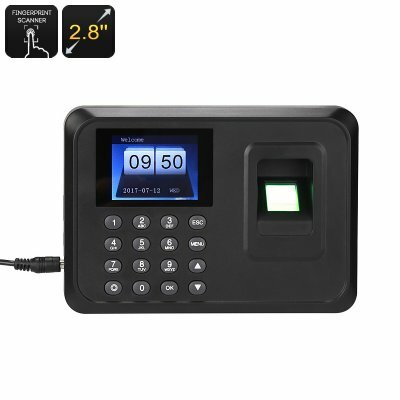 Successfully Added Time Attendance Fingerprint System - Stores Up To 1000 Fingerprints, 2.4 Inch Display, Password Mode, 100000 Clocking Records to your Shopping Cart. This time attendance fingerprint system provides you with a simple and effective way to keep track of your employee’s attendance. The cool electronic gadget requires only a fingerprint to identify your employees. This offers them with an easy way to clock into work every morning when arriving in the office. By supporting up to 1000 unique fingerprints and 100,000 clocking records, this accessory is suitable for small and large companies alike. If you wish to keep accurate track of your employee’s attendance, this fingerprint attendance scanner is the perfect gadget for your organization. With this useful gizmo, people can query their own attendance record after they have identified themselves through their fingerprint. This allows your employees to keep accurate track of their work attendance to make sure they’ll always hit the required hours by the end of the month. When using this clock-in system, you can choose to either work with its online or offline mode. When used offline, you can use the USB interface to connect the system directly to your laptop in order to extract all the recorded information. This fingerprint scanner comes with a 2.4-Inch color display that provides you with bright readings on your current time balance. Besides using your fingerprint, this attendance system also allows the use of regular password identification. Thanks to this, even people that are not in the system are able to enter the building when they have the required code to unlock the door. The benefits of using a modern fingerprint attendance system, is that it eliminates the need for using paper badges. Additionally, it will make it harder for employees to cheat the system or clock in for others as each fingerprint is unique. Thanks to its automatic sleep and standby modes, this office gadget provides you with an energy and price efficient way to keep track of your colleagues. This time attendance fingerprint system comes with a 12 months warranty, brought to you by the leader in electronic devices as well as wholesale electronic gadgets..